In which I initially intended to use the word "Carnivore", but then realized that there are many edible animal parts I would not categorize as meat. I arrived in Baltimore on MARC, the commuter rail system joining Baltimore to Washington and both of them to parts of Maryland. 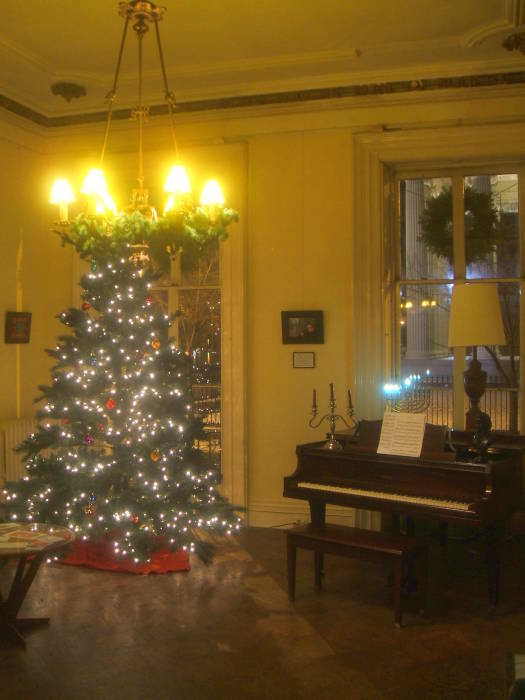 I was staying at the HI Baltimore hostel, a nice place in a renovated 1840s mansion. Grand piano, chandeliers, not necessarily the usual hostel furnishings. Just three doors down Mulberry Street from the hostel is the John H.B. Latrobe house. 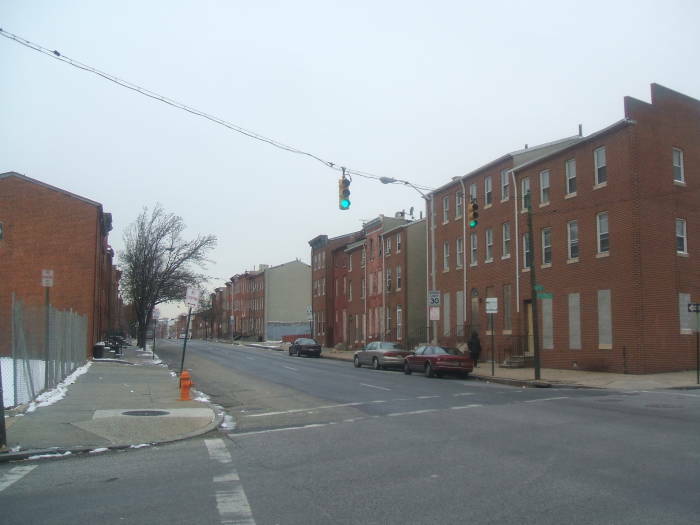 In the picture below, the hostel is the dark brown house at right and the Latrobe house is the middle of the three red brick ones to its left. 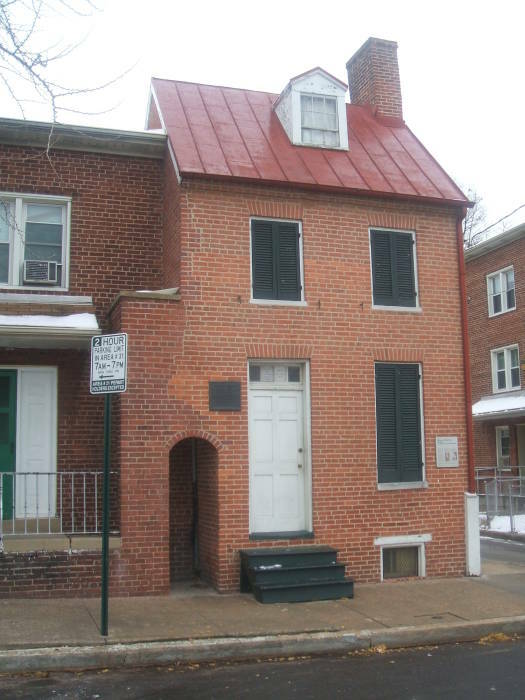 The Latrobe house is where Edgar Allan Poe really started being recognized as a successful writer. The hostel is the dark brown building at the right. 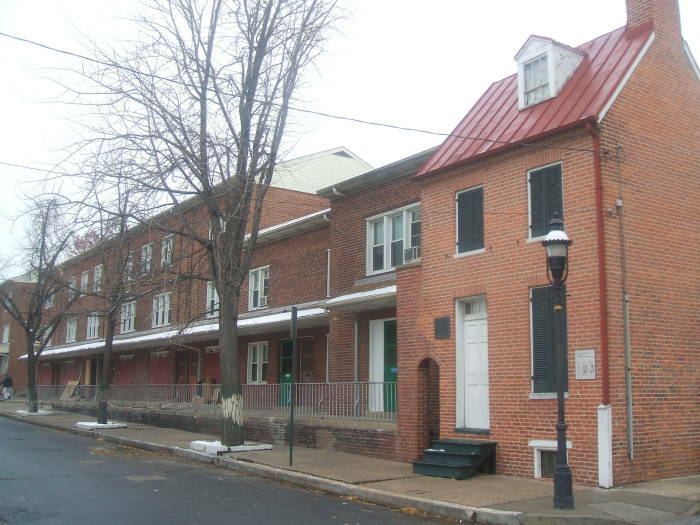 The Latrobe house is the third building to its left, the second one with a red brick face. 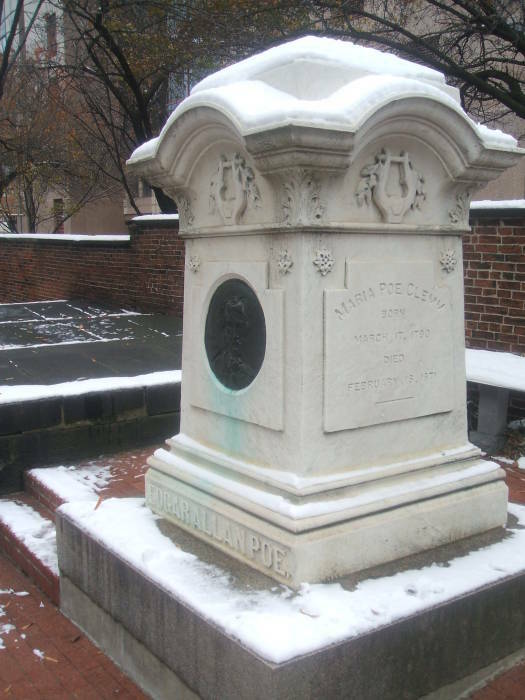 The E. A. Poe Society of Baltimore has a lot of information on Poe's time in that city. 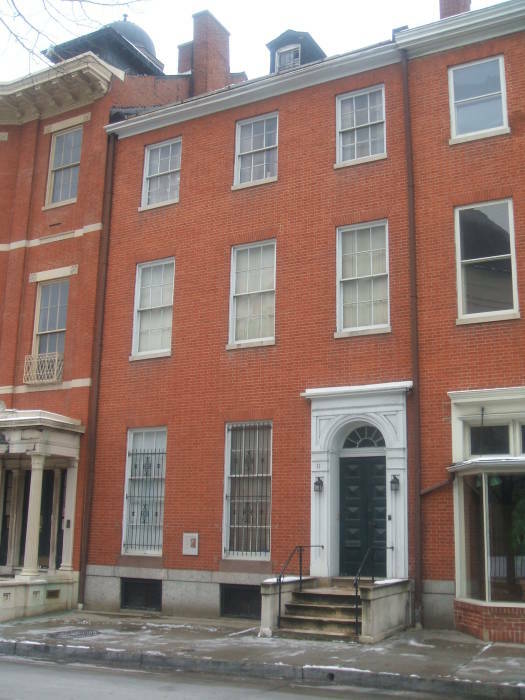 On an evening in October, 1833, three of Baltimore's most discerning gentlemen were gathered around a table in the back parlor of this house. Fortified with "some old wine and some good cigars," John Pendleton Kennedy, James H. Miller and John H. B. Latrobe pored over manuscripts submitted in a literary contest sponsored by the Baltimore Saturday Visiter. Their unanimous choice for the best prose tale was "MS. Found in a Bottle," a curious and haunting tale of annihilation. The fifty dollar prize was awarded to the story's unknown penniless author — Edgar Allan Poe. Poe had come to Baltimore in the spring of 1831, after his dismissal from West Point. He had no money, no trade and no reputation. 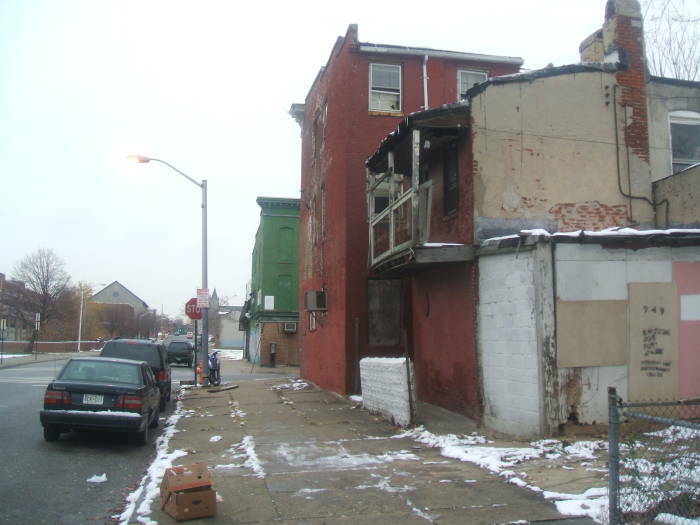 The four years he spent in Baltimore were a period of intense creativity. His major effort during those years were sixteen tales he wrote for the Folio Club, an imaginary literary club of his creation. One of these sixteen tales was "MS. Found in a Bottle". The prize for this story, the public recognition that it brought and the lifelong friendship it generated between Poe and literary patron Kennedy helped to launch Poe on his brilliant career. He left Baltimore in 1835 to become editor of the Southern Literary Messenger. Christmas tree in the hostel living room. 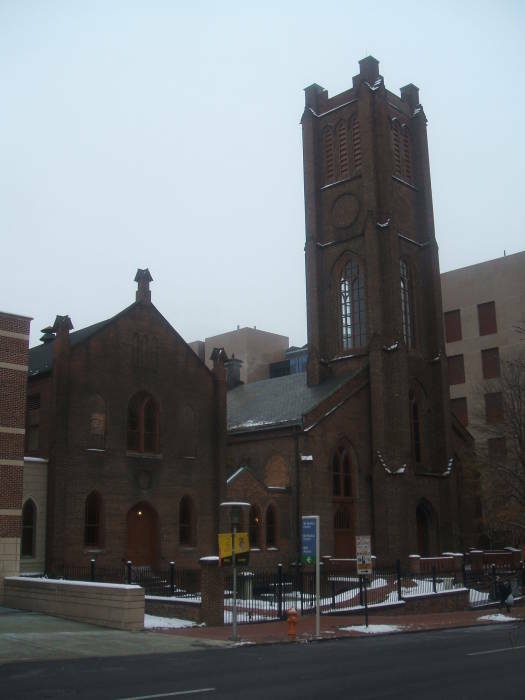 From there it's a short walk to Poe's grave in Westminster Burying Grounds at the corner of Fayette and Greene Streets. Poe was originally buried in 1849 in an unmarked grave that was soon overgrown with weeds. A headstone was placed on the grave in 1860, and in 1875 a new monument was dedicated. The grave is in the very corner next to the street corner. The graveyard itself is frequently locked, but if so there's a very close good view through the fence. 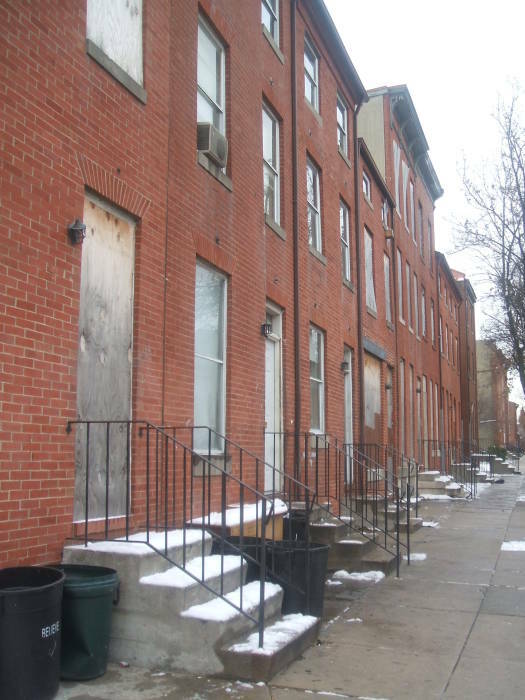 I was walking on through Baltimore toward the house where Edgar Allan Poe lived when I came to the Lexington Market, self-proclaimed as "Famous Since 1782". Hmmm. Looks sort of like a mall in the middle of the city. But I'll check it out. Wow. It's the House of Animal Parts. 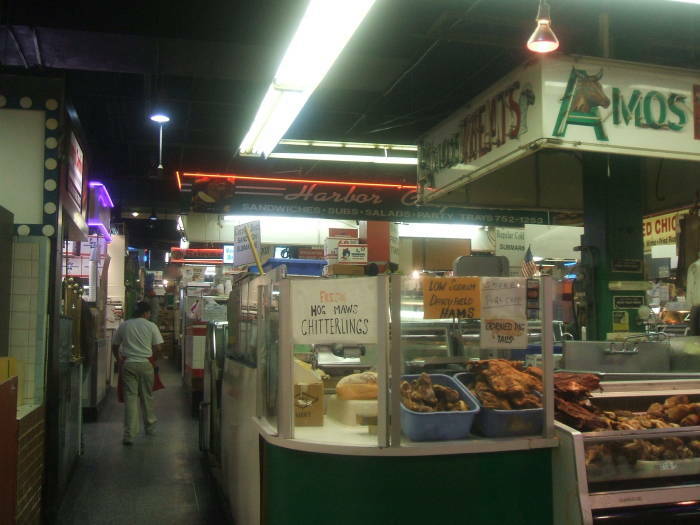 One large market hall with narrow aisles between stands for many businesses. "Parts"? What's left after that list, beaks and combs? So I look. Ah. Hen a la Wood Chipper, it appears. There are some yellow blobs of what I can identify as skin and fat, and then, yes, parts. Animal, neither vegetable nor mineral, but that's all I would specify. I'll take their word for its chickenhood. Then there are turkeys, similarly broken down, although with the necks both smoked and unsmoked, and also including "parts". And then rabbits. A surprising number of places sell rabbits. Either Maryland suffers from an Australia-level plague of rabbits, or else the bunny-munching locals are unusually interested in eating them. And yes, there are rabbit parts on offer. Hare a la Wood Chipper. Bunny a la Bush Hog. Everything but the fur. 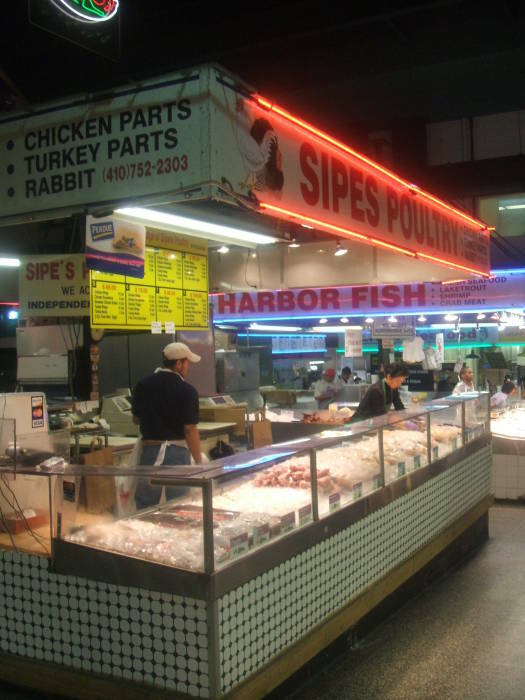 Then into the larger mammals, and the wide and mysterious array of pig parts. There are the things I could name if asked: ham, pork chops, bacon, ribs. And the things I could recognize in a list but might not think of: back bacon, feet, and so on. And then pig parts which aren't big blocks of muscle but which are eaten by some people all the same: chitterlings, hog maws, and scrapple. 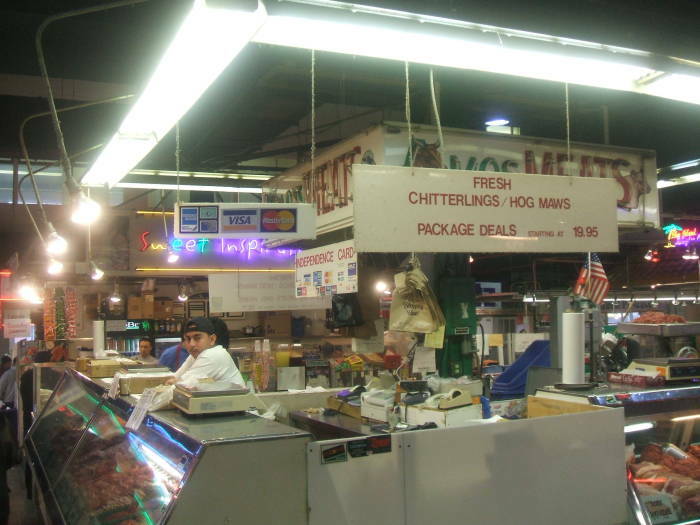 I suppose that chitterlings are what are pronounced and spelled "chitlins" in the south, but there might be some subtle distinction known to aficionados of pig parts. I have no idea about the distinctions between chitterlings, hog maws, and scrapple, beyond the fact that scrapple seemed to be sold exclusively in plastic buckets like lard. Oh, that reminds me, the pig-part places also had buckets of lard. Many buckets of lard. 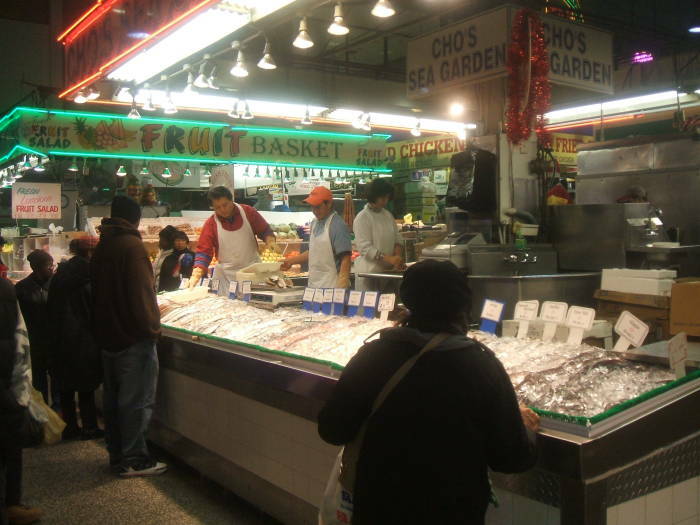 Other stands had fish and other sea creatures. But they were mostly sold as entire creatures. There were no bags of fish parts. Although I'm sure that they could fire up the wood chipper if you asked. One day, in Baltimore, I walked to Edgar Allan Poe's House. It's beyond the archetypal "urban blight" and more like Chechnya but without the people. It's creepier than most of Poe's work, more like something out of H.P. Lovecraft. Ghastly and eldritch. 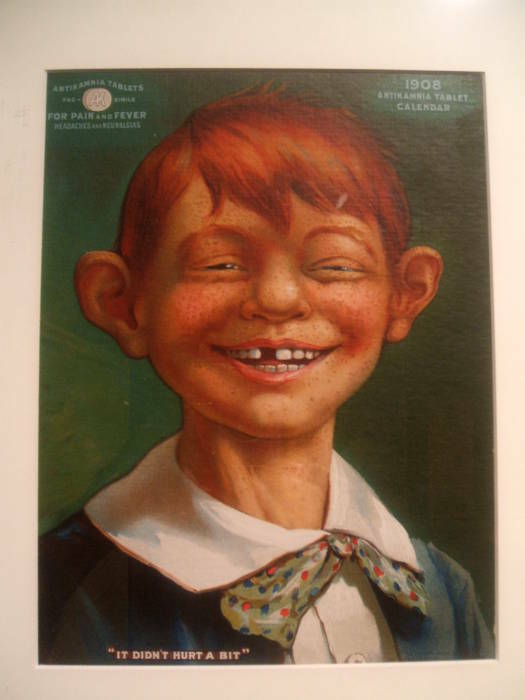 You expect to glimpse snarling packs of feral children scurrying down the alleyways behind what look like crack houses. 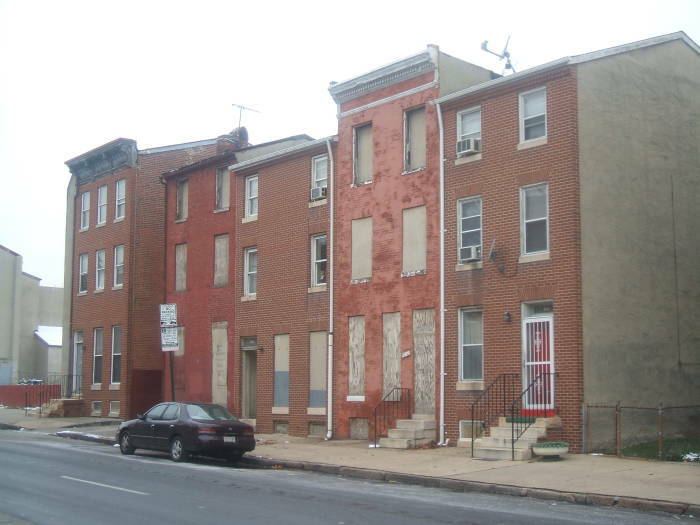 Many of the residential buildings are boarded up, and the rest seem lightly populated. There are a few businesses operating. Maybe one place every three or four blocks selling malt liquor and lottery tickets and not much else. I eventually found Poe's house. It's not obvious, there aren't many signs. I doubt that it gets many visitors. You probably wouldn't want to drive into that area and park, not unless you drive a vehicle out of "The Road Warrior", and not many people are going to show up there on foot. It is open for visits by scheduling in advance with the historical society. "The little house in the lowly street with the lovely name." That was how Edgar Allan Poe described 203 Amity Street, where he lived from 1832 to 1835 with his grandmother, aunt, and cousin Virginia, whom he married in 1836. 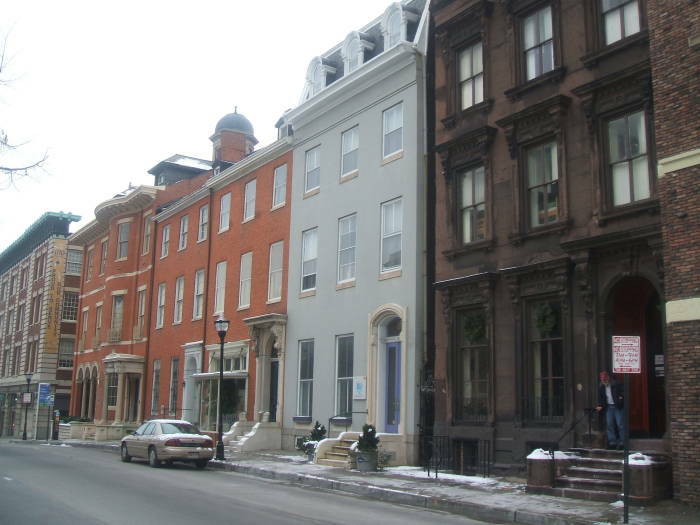 While living here, the famous American writer first gained public recognition. 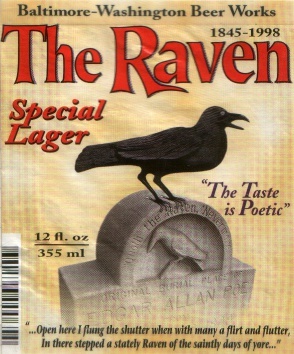 In 1833, Poe won a literary contest sponsored by the Baltimore Saturday Visiter, one of the seventy magazines that burst upon the local scene in the early 19th century. The three judges, who included J.H.B. Latrobe, unanimously awarded the $50 prize to Poe for "MS. Found in a Bottle". "Distinguised by a vigorous and poetical imagination", declared the judges, "a rich style, a fertile invention and varied and curious learning". Poe became famous for his lyric poetry, discerning criticism, detective stories and hair-raising "tales of the grotesque and arabesque", but his personal life was clouded by difficulties with alcohol, intermittent poverty and tragedy. 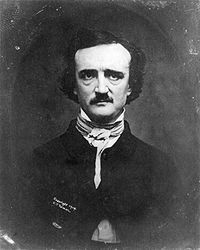 Poe died in Baltimore under mysterious circumstances on October 7, 1849, having been found four days earlier in an unconscious state on Lombard Street. He is buried in Western Burying Grounds at Westminster Church. From there it was back into less scary parts of Baltimore and the National Museum of Dentistry. Yes, there is such a thing, and it's even affiliated with the Smithsonian. 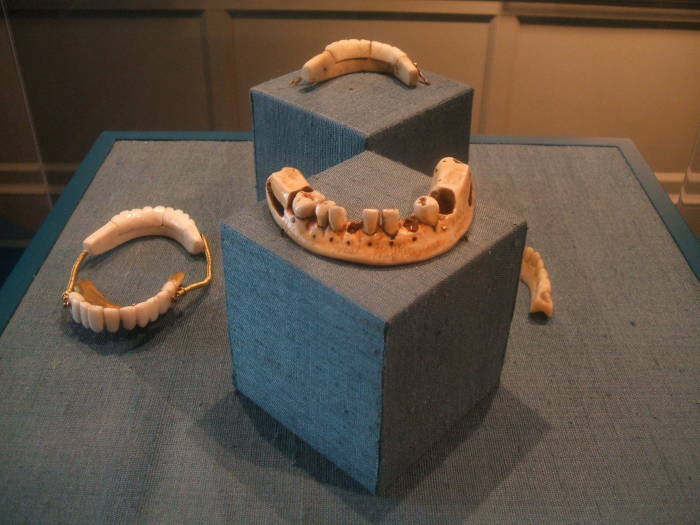 They also have George Washington's teeth. They were made of ivory stained and cracked so that they LOOKED wooden. As if that's any better. 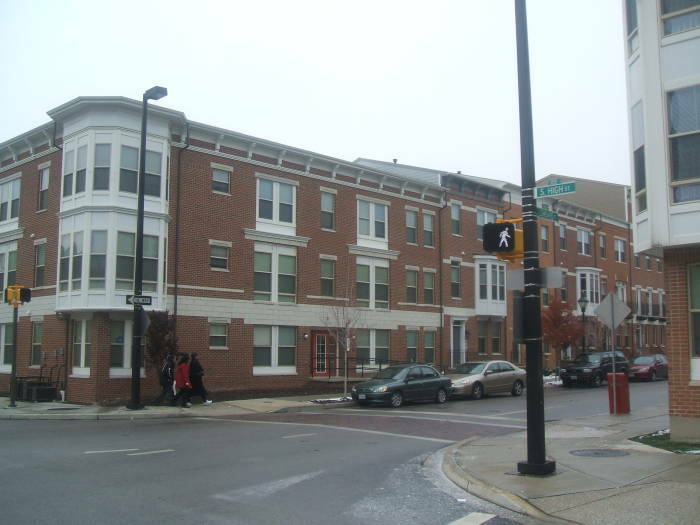 The last Poe landmark in Baltimore was just a site-of spot today. 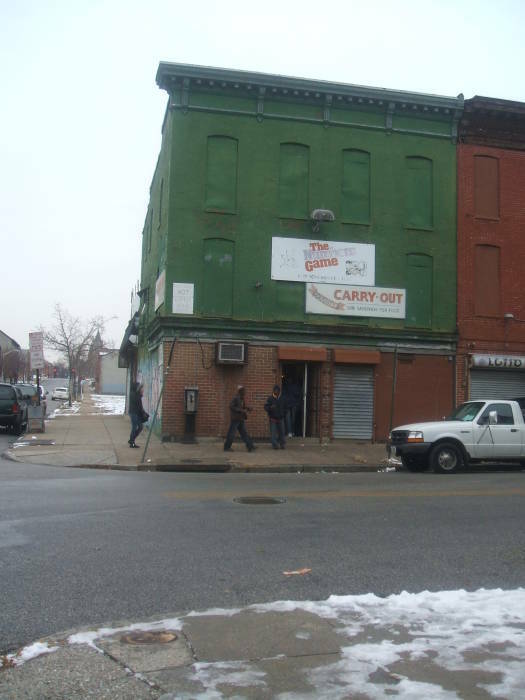 44 East Lombard is the former site of the 4th Ward Polls tavern where Poe was drinking the night before he collapsed, never to regain consciousness. Today the location is a hive of yuppies. Back at the hostel, this guy showed up sporting a cane, a wild west gunslinger mustache, and a slouch hat. Think of a slightly lame Sam Elliott. He comes into the living room where I'm sitting, introduces himself as Ted, and starts quizzing me about the docent training program. I have no clue. Ah, then I should just tell him where Christine lives since that must be where everyone is. Again, I have no idea what he's talking about. At first I thought he must have mistaken me for someone he was planning to meet there (perhaps a fellow docent-in-training and acquaintance of Christine), but then I realized that he was just generally garrulous. He started telling me about his plans to write some letters to ADM (Archer Daniels Midland, the enormous grain agricorporation) explaining to them just what they should do, and do immediately. Specifically, best as I understood it, they needed to get into intensive crop rotation and simply grow two complete crops each year: soybeans and canola in the south, or soybeans and corn in the north. That would lead to lots of biofuel developments (and, per my vague understanding of agriculture, require some significant climatic changes). As soon as he could find the time to mention this to ADM, we would all be supplied with cheap fuels. Somehow I mentioned that I was from Purdue, which really got him going. Why, there's some professor at Purdue who is researching palm oil, and what Ted really needed to do was light a fire under the University of South Florida so they would lure that professor away from Purdue (which is a good school, but poorly placed for Ted's schemes) to USF. South Florida? Yes, because just as soon as Ted gets, oh, let's say for now several tens of thousands of square miles in Florida and Texas dedicated to oil palm orchards, why, that could provide most of the U.S. fuel supply right there. You can't say that he lacked ambition. Or imagination. Yes, that would reduce our dependence on the Persian Gulf region, I said. Ah, he thanked me for reminding him that he also needed to send a letter to Bill Gates. That letter would explain how he (Bill, not Ted) needed to fund solar-powered desalination plants to provide trickle irrigation and thereby convert the Arabian peninsula into a lush garden and large exporter of various vegetables and fruits. Sort of like the transformation of Arrakis. Large-scale philanthropy and engineering projects would lead to booming agriculture, which would lead to vastly improved quality of life, which would lead to cheap oil (although by then we'll be hip-deep in palm-oil-derived fuel from Ted's immense Florida and Texas palm plantations) and an end to terror. Since he pretty much had Energy and Food all wrapped up at that point, I begged the excuse of a prior commitment and left before he started explaining his plans to revolutionize Medicine and Space Exploration. What else is in Baltimore? The Inner Harbor, which is basically a high-end shopping mall plus some theme restaurants, except it's on a pier as opposed to out by the bypass. There are two large and nice art museums in Baltimore, the Walters and the Baltimore Museum of Art. And lots and lots of animal parts. From Baltimore I took Amtrak north to Philadelphia.